Palmiers look fancy. 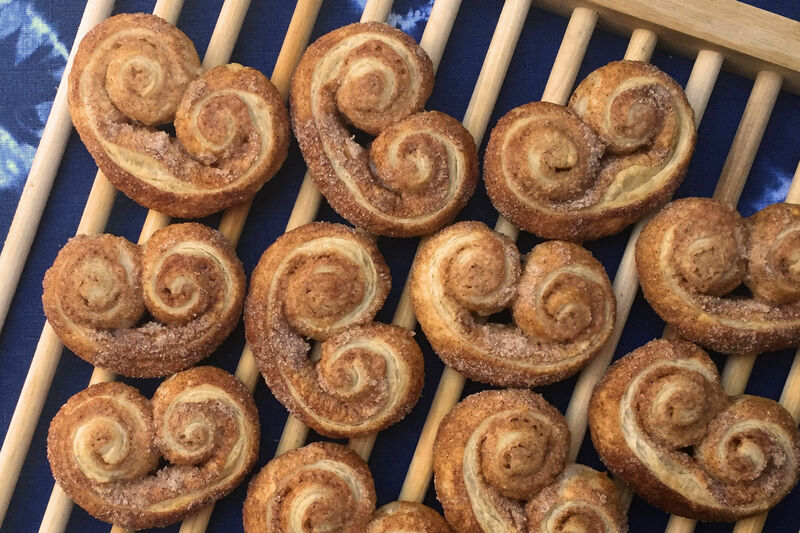 You may have spotted these delicious swirling pastries through bakery windows and thought they were well beyond your own baking skills. Surely only professional bakers can produce these sweet delicate confections. I am here to tell you that is not the case. 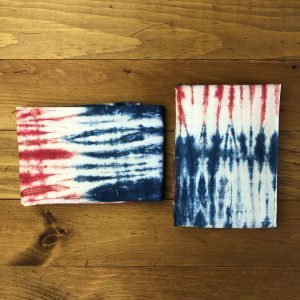 In fact they are incredibly easy to make . 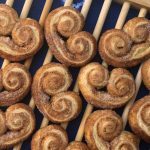 These Cinnamon Sugar Palmiers are made with only three ingredients and even a beginner baker can pull them off. Palmiers are made with puffed pastry dough. Making your own puffed pastry dough is a bit of a process which you can easily avoid by simply buying it at the grocery store. I imagine a lot of bakeries make their own puffed pastry from scratch, but the ready made variety is such a time saver and can successfully be used for so many different kinds of home baked desserts. I always have a box of it in the freezer. 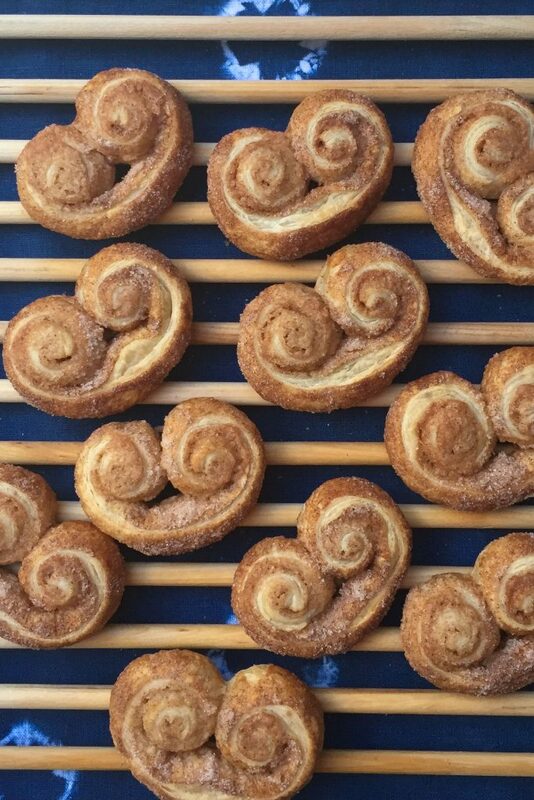 I urge you to try this Cinnamon Sugar Palmier recipe out at least once. They are sweet, light, flaky and crunchy. Perfect by themselves with a cup of tea or served as a little embellishment with a dish of ice cream. I believe once you try them, they will become one of your signature desserts that you are known for within the family. You may want to keep it to yourself how easy they are to make. I won’t say a word. In a bowl, mix together the sugar and the cinnamon. 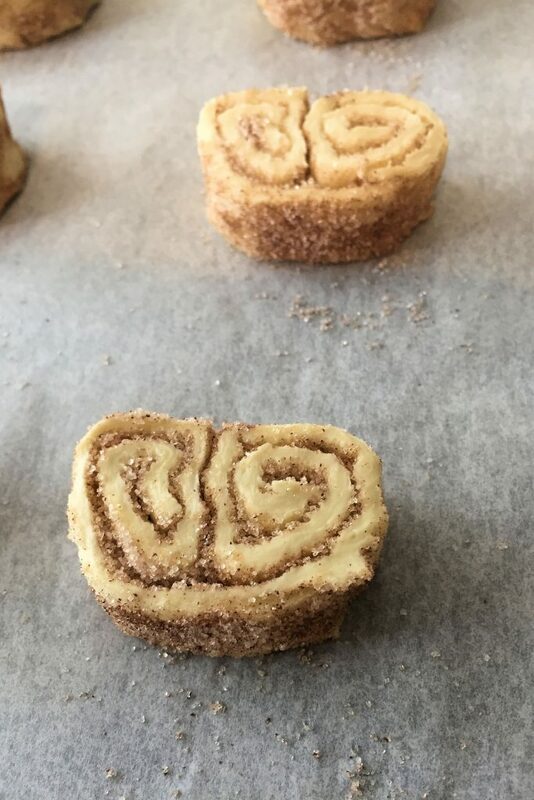 Pour out about half the cinnamon sugar and spread it out on the counter top, covering approximately the size of the sheet of dough. Carefully unfold the cold puffed pastry sheet and place it on top of the sugar. Take the remaining sugar and sprinkle it over the top of the dough. Using a rolling pin, roll the dough out until it is approximately 12" x 12". Keep turning the dough to get an even square. You are also working to press the cinnamon sugar into the dough. Note where the middle of the pastry sheet is located. Gently but tightly, roll one side of the dough towards the center, jelly roll style. Roll the opposite side of the dough towards the center, to meet the first roll. 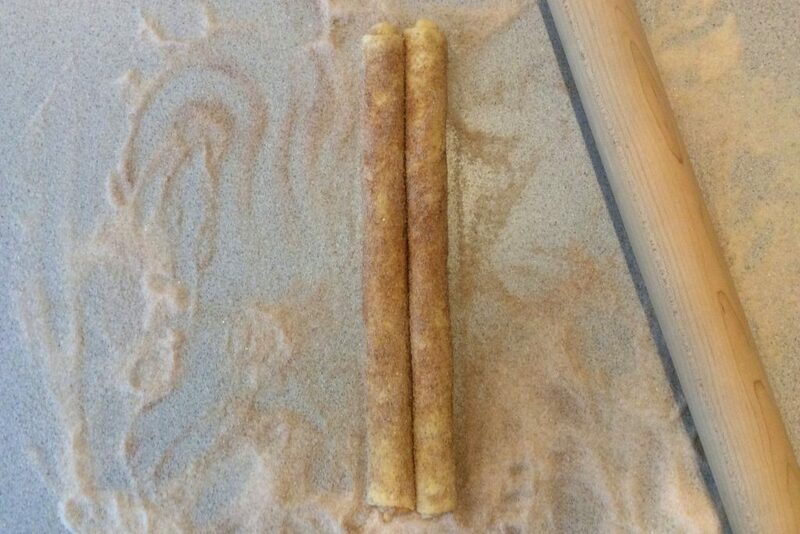 The two rolls of dough should look similar in size. 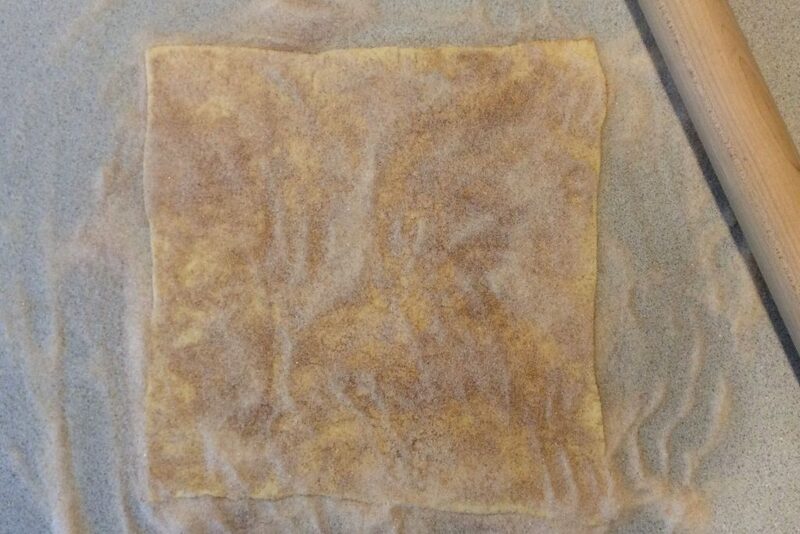 Transfer to a baking sheet lined with parchment paper, cover and refrigerate for 30 minutes. Slice across the rolls of dough with a sharp knife into 1 inch pieces. * Take each piece and lay it flat on the baking sheet, spacing them about 3 inches apart. Bake for 15 - 20 minutes or until a light golden brown. Rest on the baking sheet for a few minutes then carefully transfer to cooling rack. Always thaw puffed pastry dough in the refrigerator. 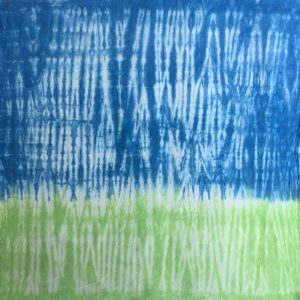 It is ready when it feels softer and you can open up the sheet without it splitting at the folded seams. You will have a lot of sugar left over on the counter after rolling out the dough. You can double the recipe by using both puffed pastry sheets that come in the package. You could double the amount of sugar and cinnamon but you probably will be alright just using one and a half times as much. If you do decide to use both pastry sheets, make sure you keep one sheet refrigerated while working on the other. Puffed pastry dough must remain cold. This recipe calls for cutting the Palmiers into 1 inch pieces. Other recipes have you cut them thinner such as 1/2" or 5/8". It is a preference on how you like them. Feel free to try different sizes to see what you prefer. Keep in mind baking times may need to be slightly adjusted.